No parent wants disobedient children. But it’s surprisingly easy to let our children get away with disobedience. It’s easy to allow outward obedience accompanied by whining, complaining, or grumpy looks. It’s easy to allow a child to correct us, debate with us, or tell us how she will obey on her own terms. It’s easy to resort to cajoling, reasoning, manipulating, distracting or bribing. It’s easy to issue threats, give multiple warnings, or repeat our instructions. It’s easy to allow excuses, or even worse, to come up with our own reasons why he’s not obeying: I’m not sure he heard me. Maybe he didn’t understand me. He’s tired. He’s hungry. He just forgot. He doesn’t know any better. He’s too young. He doesn’t know how to control himself. It’s easy to make excuses for ourselves if we don’t want to stop and discipline our child: I’m busy making dinner. I’m just trying to have a conversation with someone else. I don’t want to upset him. Or maybe, I’m just too tired. We’re tempted to let our children disobey because, at any given moment, it’s easy. I know this from personal experience. With my four children ages one to five, I’ve done all of these things more than I like to admit. When I allow disobedience, it’s usually because I don’t want to stop and deal with that problem, right there, in that moment. I’m tempted to make my present ease and comfort more important than my child’s growth. I would rather keep reading my book (or whatever I am doing) than get up and take my responsibility as a parent seriously. But when this happens, I’m disobeying God. I’m believing a lie. My project, conversation, or comfort is not more important than my child and the job God has given me of training him to obey. It sounds hard to hold our children to God’s standard of obedience. Requiring first-time, respectful obedience may be hard for a few days if we’ve let our standards slide. But once we’ve drawn clear boundaries and started to consistently enforce them, our children will learn that we’re serious, and life will actually get easier. Plus, everyone will be happier to boot. God has given us a position of authority over our children, and we’re responsible to faithfully and lovingly exercise that authority. 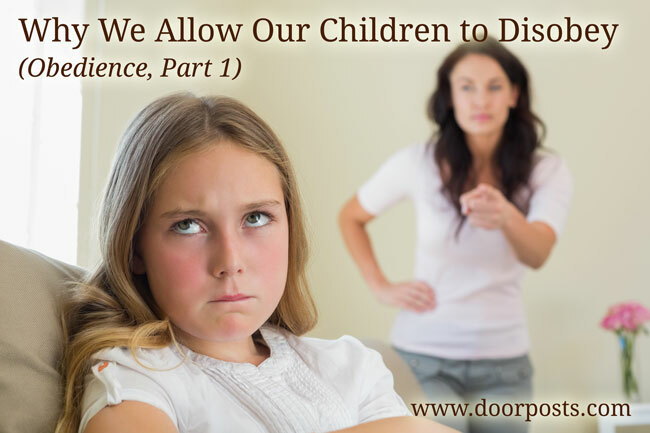 Allowing our children to disobey effectively hands them the reins of our household and creates a child-run home, which is no fun for anyone. In the next two weeks, we’ll talk about why obedience is good for our children, and then some practical strategies for teaching obedience. If you have thoughts or questions about teaching obedience, please leave a comment below! I have a 13 year old and a 14 year old who are very disobedient. How can I turn things around and have them obey after all these years? I am sad and frustrated. Thank you! just begin SETTING and KEEPING biblical boundaries. It’s not “too late” to start expecting obedience. You all have bad habits to break….be forgiving, be strong, rely on God for strength to this thru. I have 3 children ages 17, 14 & 10. I don’t think it is ever too late to take authority and let your children know that you are the parent and they are the children (in that order). It’s all about consistency though. Have a family meeting let everyone know what the new expectations will be, what the consequences will be and be ready to follow through! Once they learn that you are serious, it will get easier. Be patient and don’t expect changes immediately, they are going to try to keep getting their way. Thank you for covering this topic! My question is this: I have no problem spotting the disobedience, but where I get stuck is what is an effective way of disciplining and putting a stop to it? I bring it to their attention time and time again, but it doesn’t seem to make the behavior stop. When you’re in the moment it’s tough to think of what to do on the spot! I’ve prayed about this a long time, if you have any insights they are greatly appreciated! Lisa, thanks for the question. We’ll talk about specific strategies in a couple weeks, and I hope that will be helpful. Praying is the best place to start! How do I keep updated on the weeks to come with your amazing work here? That’s my exact problem. Effective consequences that fit the crime. I have a couple but it seems I always resort to time out and my children are getting too old for that. I have three children. My oldest is good about obedience, but I struggle with the 9 year old! I will be following this topic! I didn’t realize whining was disobedience, but could see how life would be easier if whining wasn’t allowed. Thank you for this topic! I am in a situation where for many years my husband and I were not on the same page disciplinary-wise. When the kids were younger, I wanted to train for first-time cheerful obedience, and he, although he said it was a good idea, took a non-confrontative or hands-off approach with the kids. During that time I tried my best to train and discipline and I also made sure to honor Dad as best as I could. Now our kids are older and thankfully he is seeing the results (he has apologized to me and admitted his failure and is seeking God for direction). While that may sound like a happy ending, there is a lot of damage control that needs to be done, and that is my question; with older kids (youngest being 7) what is a good approach? What are some strategies even with teens that you could suggest? Thanks for your help. I think obedience becomes a more complicated issue as children grow older. If you can apologize for the past and let them know what to expect moving forward, explaining that your desire is to please God by being better parents to them, for their good, I think they will respect that. The book Child Training Tips by Reb Bradley would probably be helpful, and I hope the upcoming posts here will help address your questions too. Thanks for joining the discussion! So happy that this topic is being covered. I have twin 11 year old boys and it seems all we ever do is fight and fight or I am constantly yelling and saying horrible things that I wish I could take back as soon as they come out of my mouth. Also, yes I am tired and weary of arguing all the time over every little thing. I am so great at making empty threats and not following up because afterwards when they are not being belligerent or disrespectful anymore they are my sweet little angels and I have trouble remembering why I would/could be so upset in the first place. It’s a never ending cycle. Can’t wait for more! Thank you. Exactly what we need. A couple others have already expressed this, but I need help in discipline for teens. I’m always taking electronics away, but on days they don’t have any, THEN what?! Also, I struggle with the balance between grace and mercy. God is pretty patient with ME when I don’t obey right away. And I doubt myself. “Did I really need to ask THAT child to do that task? I should have asked one of the others who doesn’t always get asked,” so I don’t follow through. Thank you! Looking forward to Biblical guidance! A lot of people toss the phrase around, “first-time, cheerful obedience” but Ive never witnessed this. Ever! I think certain personalities in children can lend towards quicker obedience and with other children, the parents can do everything “right” and the child will still have authority issues. Ive tried techniques from this blog, Shepherding a Child’s Heart, Getting to the Heart of parenting DVDs, and Dont Make Me Count to Three. After three years (my son is four) I am exhausted! Ill keep going with all of it but Im just praying for him and waiting on the Lord to work on his little heart. Until the Lord changes a heart, there cant truly be cheerful obedience, in my opinion. Theresa, thanks for sharing your experience. Praying and relying on God to change a heart is where we all should be starting. I pray God will answer your prayers and bless the fruit of your labors! It won’t happen 100% of the time, but first-time, cheerful obedience is possible, by God’s grace. Hopefully the upcoming blog posts will provide some useful fuel for your journey. Take heart, mama! You’re right: God changes hearts! But training can yield huge results. I’m thankful to have a number of friends in my life with large families, many with now-adult children. I HAVE witnessed first-time, cheerful obedience in these families for years. They’re an inspiration. Keep on keeping on! my kids are the most disobedient when I am physically unable to stand over them and make the do what they are told (like when I’m driving or nursing). I give them tickets (worth .25) when I catch them being good. I want to keep up with this topic. I have 6 children ages 2 – 13. It is hard to keep up with them all especially while homeschooling them. Needing to know good ways to deal with the different stages and different wrongs. No one can stand up to God’s standards. That’s what Christ did for us. Of course children need training, but they certainly need to be reminded that their behavior does not save them or make them alright. I want my kids to obey because they love me and because they love God. Christ came because we fail to meet God’s standards. When my children disobey it’s a good time to remind them of our inability to stand up to God’s standards, and point them to the hope of Christ. April, I agree with what you’re saying. We need to teach our children to strive to obey God out of love for Him and in dependence on Him — not expect them to obey on their own strength. Looking forward to this series of emails! We have gotten lazy disciplining our nine-year-old. It just seems easier to just let it go. But truth is, his behavior is getting worse! With two boys left at home, ages 13 and 16, I have some of the same questions as those posted. I am looking forward to seeing your replies. These questions are great, and I believe the next couple blog posts will better address some of these issues. For those of you working on obedience with older children, I heartily recommend Reb Bradley’s book Child Training Tips. My children are still young, but by drawing on wisdom from God’s Word and the experience of others who are further down the road, I hope to present some helpful thoughts over the next two weeks. Thank you for the comments! O I need this so much! I especially need ideas on discipline! So timely! My husband and I were just discussing this an hour ago! I especially look forward to reading part 3. We have 3 kids, ages 5, 3.5, and almost 2. We’ve learned that 2 yr olds seem to require MUCH more physical discipline than any other age under 5….and that’s where our youngest is now. I totally struggle with the excuses you listed. I feel like if I run to break up the bickering the instant it starts, I am literally never going to accomplish anything around the house. One of my biggest questions is, how do I discipline the older ones when I’m trying to nurse the little one to sleep…and raising my voice (because the kids are yelling in another room) or unlatching the baby would surrender all hope of a peaceful naptime (which then affects homeschool time with the 5 yr old). Also, how do I get them to quiet down, when their noisy fit is in response to already having been disciplined for something else? We live in an apartment, and the neighbors complain sometimes. I made a small change to the post above: I had mentioned requiring “first-time, cheerful obedience,” but perhaps “first-time, respectful obedience” is a better way to say what I mean. Cheerfulness is not so much something we can require. It’s the fruit of the relationship we have with our children. Our children will be more inclined to obey us cheerfully if we’re walking in fellowship together, if they know we’re walking the same path with them, and if we’re striving to walk in obedience to our Heavenly Father and teaching them to do the same. If we merely expect them to obey “because I said so”, if they see hypocrisy in our own walk, or if there isn’t an atmosphere of Christian love in our home, requiring their obedience will more likely provoke their anger, not their joy. I’m so thankful you are doing this! Will you please address this issue in some way in your posts? I have a two year old boy and a five year old daughter. My son (2) seems straight forward. I say “Come here,” he doesn’t, he gets disciplined, then he obeys and cheers up. My daughter, on the other hand, has been an enigma! She is so soft and obedient in some ways (If I say, “Come here” or “do this” she usually complies easily and is sensitive when others don’t obey well), and then, many other times, she whines sooo much! Usually these are when it’s time to change schedule or when she wants to do something and we say “no.” She pouts and whines and cries real tears and is so frustrated and angry with us. And then, a spank on her behind only exasperates her and we all end up in real tears. I feel like explaining to her and find myself arguing and debating with her then. I don’t know what next… So I guess my question is more along the lines of, she seems really sensitive sometimes and analytical, and the spanking doesn’t work. What do we do with hugely sensitive, but whining and not cheerfully obeying children when it comes to doing a family’s plan? Thank you! To whom is Ephesians 6:1 addressed? ML, it seems to be addressed to all the children of the believers in Ephesus. Where is “first time cheerful obedience” listed or described or commanded from God in the bible? Please don’t hear this as a confrontational question…just curious. I was just thinking about God and how he relates to his children, who are often disobedient & grumbly, and find him working on ours hearts to change us. Just a process not an absolute. As parents we have no power to change our children’s hearts…that is a God thing. Yes, we can force morality & outward obedience but true heart level change is a work of grace. Thanks, Christina, for asking this question. Outward obedience that is given disrespectfully, with complaining, or on our child’s own terms, is not really obedience because it reveals a heart that is out of fellowship and still in rebellion to God’s established authority. Pure obedience from the heart is God’s standard, even though we all fail at this and must depend on His mercy and grace. For biblical examples of God’s displeasure with partial obedience, see Moses and Aaron in Num. 20:7-12, Saul in 1 Sam. 15, and the story of Jonah. We need to point our children to the heart-obedience standard, not just outward compliance. And many times they will fail. That is our opportunity to teach our children that they can’t do this on their own, that they need Jesus, both to forgive their sin and to change their hearts. While we train our children to obey God’s standards, we must also pray to God and depend on Him to do His work in their hearts. Absolutely. And you’re right – we can’t change their hearts – but we can do our part by training them “in the nurture and admonition of the Lord.” That training work we do is part of God’s grace in their lives. It seems I am constantly addressing the same issues regarding attitude. I can dole out consequences and have them serve them, however, I am unsure on how to change their attitudes. I can’t make them obey with joy or be cheerful. How do I address this?